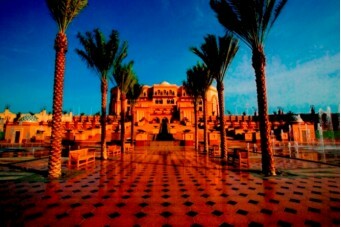 Emirates Palace has 302 rooms and 92 suites all offering uncompromising luxury. All rooms are decorated in gold and silver leaf and marble throughout. The Palace Suite - include 3 bedrooms, a dining room and a spacious living area. Also includes a spa pool and rain shower and all have a sea view. Khaleej Suite - include a spacious living area, bedroom, dining room and bathroom. Situated at end of each wing so have 180 degree views of the beach, pools and gardens. Luxury Grand rooms - Coral Grand have views over the Palace Park, Luxury Rooms with partial sea view or Abu Dhabi Corniche and Diamond Grand rooms overlook the sea. Emirates Palace is located 1km from Abu Dhabi city centre, or 38km from Abu Dhabi airport or 180km from Dubai airport. The hotel can provide transportation services on request. This magnificent landmark exhibits luxury like you have never seen before. The Emirates Palace is one of the most luxurious hotels you will find in Abu Dhabi in the Middle East. The Palace has 302 rooms and 92 suites which are all fit for a king and combine luxury and 22nd century technology with elegance. Every room is decorated in Arabian regal splendour, and all guests are met and exceeded every single time. Each room hosts an advanced multi media system with a touch screen control panel which allows guests to control all room appliances including lights, air conditioning, stereo and television. There are 50 inch plasma screens in all rooms, and 50 and 61 inch plasma screens in the suites. A interactive Tv also provides guests with high speed internet, access to your room bill, room service and in room entertainment. The Palace also boasts approximately 11 restaurants/cafes, and the most technologically advanced conference and meeting facilities in the Middle East. The total meeting and conference facilities exceed an area of 7000sqm and include a state of the art auditorium, grand ballroom, a choice of 48 meeting rooms, high tech media and business centre and a massive outdoor function space of over 10000sqm. Not only does the Emirates Palace cater for the business man, but it also has an abundance of leisure activities as well. These include 1.3km of private beach, two stunning large swimming pool areas on both East and West wing, two state of the art fitness centres in both East and West wing and an array of boutique shops. During your stay at the Palace there are a number of activities you can indulge in at your leisure. There is a huge choice of restaurants ranging from an Italian restaurant, Vienna café, Caviar Bar and a Havana Club cigar bar. There is also a private restaurant called the Palace ceremony where you are the only guest there. Emirates Palace also hosts the most technologically advanced meeting and conference centre to entertain your business clients. There is also a private beach, and two huge swimming pool landscapes at each wing to enjoy. If you have had enough of relaxing why not try out one of the state of the art gymnasiums? Why not explore Abu Dhabi – there is a beautiful variety of mosques and a wonderful Corniche. You could also visit one of the 200 deserted islands situated just off the coast and have your own private picnic. Other exciting activies include dune-driving, wadi-bashing or perhaps an organised desert safari tour. Other popular pass-times in Abu Dhabi are sand-skiiing, horse-racing, scuba diving, deep sea fishing, camel racing, golfing and of course shopping!